Today I am having A coffee date with… Stephanie Wray. Stephanie is a magnificent lesbian artist and art therapist. She and her wife have a beautiful, smart and creative daughter and 2 dogs. Stephanie has been in the art sphere for the last 25 years. She attended Naropa University after losing everything in a fire when she was 24 and finding her talent thanks to therapy. She has been facilitating workshops and working with art since then. R: Stephanie, are you facing any challenges at this moment? Have you found any business challenge due to your sexual orientation? S: Since graduating I have been focusing on the virtual aspect of my business. The biggest challenge is helping people to understand exactly what process art and art therapy are and are not. A lot of time goes into the educational process in helping people understand help in the official creating art can be. I have to say that I haven’t experienced anything overtly that has challenged my business. I am not sure why other than I really set my intention to have an open caring space, where people come to have fun, de-stress and create. I believe more than anything people are curious to ask questions, again leaving me to be an educator. Always reminding them that each individual is unique and different and I can’t speak for a whole class people. R: What are the benefits and disadvantages of being an entrepreneur and being yourself? 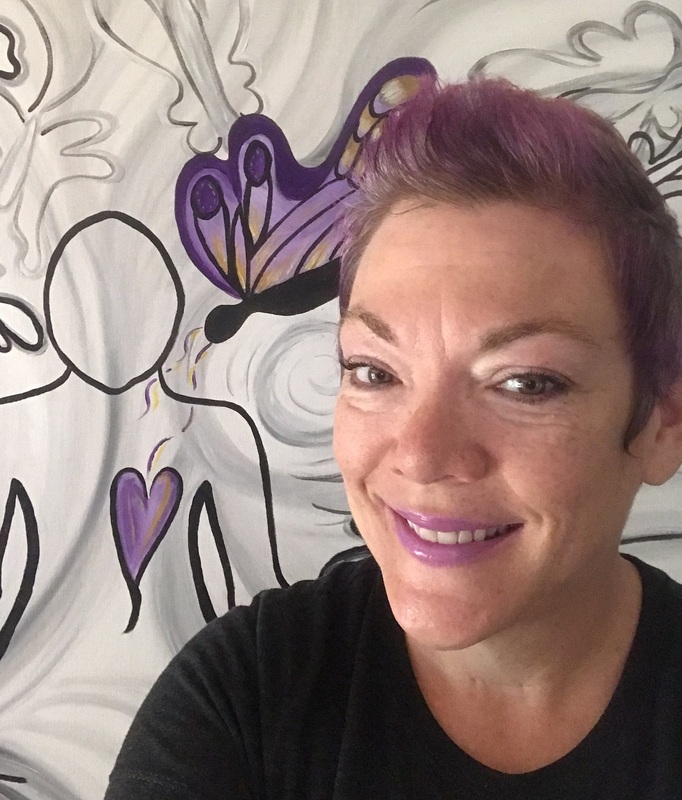 S: As a self-employed lesbian, mom, wife, daughter, sister, friend, artist, teacher and therapist with purple hair. I find my uniqueness to be a benefit where people feel more comfortable being open with me and be more approachable. It seems that the people that I need to bring into my world are attracted to my energy and the ones that are judging stay away. R: What’s your opinion on the massive movements for women’s rights? S: I think the women’s movement is great and much needed to change the paradigms of our societal norms. There’s no reason why a woman should be treated less than, have their bodies managed by government and limitation set upon them based on other people’s opinions. R: Where and when would you go if you could travel in time? S: If I travel back in time I would go to New York City during the abstract expressionist movement. I love the idea of bustling galleries, artist collectives and coffee house chat and paints that I read about in the autobiographies and biographies of the artist of that time . Those artist were groundbreaking and full of energy and I think I would fit in great ! Thank you for your time Steph. It was lovely interviewing you. Influencer Stephanie Scolaro Speaks out on Social Justice, Social Media and Animals. WOW! Working Out With Stephanie Ruhle!